Flemish-born painter and etcher of marine subjects, active in Holland. His parents moved to the northern Netherlands in 1584. His teacher was probably Hendrick Vroom. Porcellis worked in many places. He is first traceable in Rotterdam where he went bankrupt by 1615. He then moved to Antwerp. By 1622 he returned north and settled for a few years in Haarlem, then in Amsterdam, next in Voorburg near The Hague, and finally in Zoeterwoude in the environs of Leiden. The properties he amassed before his death in 1632 indicate that he had accumulated a considerable fortune during his last years.Porcellis was regarded as the greatest marine painter of his day and his works mark the transition from the busy and brightly coloured seascapes of the early 17th century, with their emphasis upon the representation of ships, to monochromatic paintings which are essentially studies of sea, sky, and atmospheric effects. 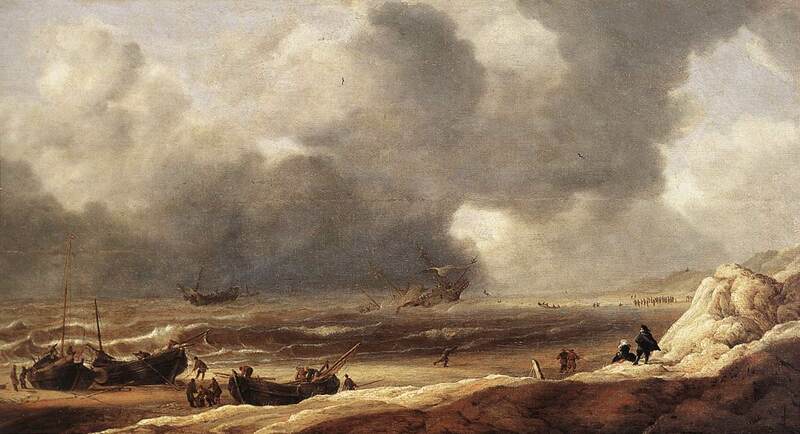 His favourite theme was a modest fishing-boat making its way through a choppy sea near the shore. Rembrandt and Jan van de Capelle collected his works. His son Julius (c. 1609-45) was also a marine painter.